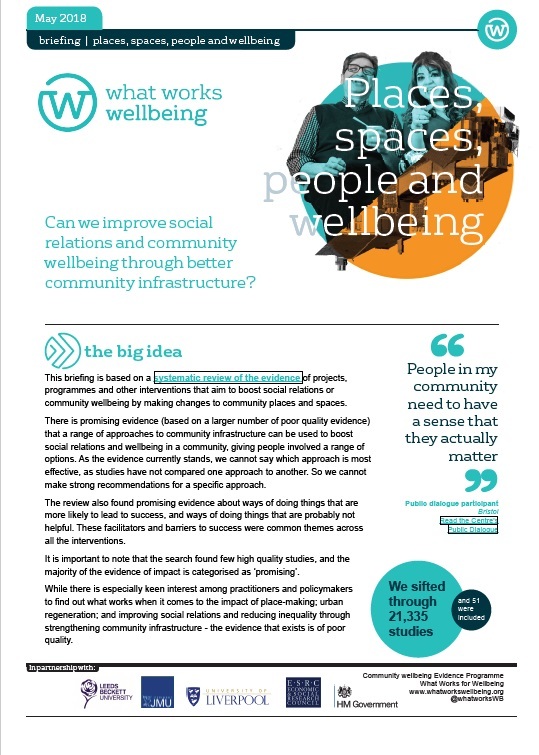 Places, spaces, social connection and people’s wellbeing: what works? 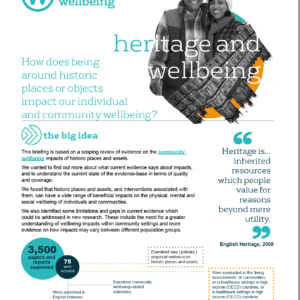 What makes the places we live, work and meet up in better places for our wellbeing? Our social relationships are consistently found to be an important part of our overall wellbeing. Understanding what communities and organisations can do to best support social relationships is less obvious. 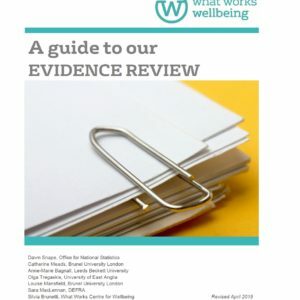 Here we bring together the global evidence base, sharing what’s currently known about various approaches, so that organisations and communities can do more of what looks like it helps and work together to understand how best we can make more of a difference to wellbeing and social connection in the UK. Back in 2017 we published a scoping review to find the evidence gaps in our understanding of improving social relations – a loose term that covers a wide variety of interactions, interconnections, and exchanges between human beings and the physical and social environment. squares, parks, play areas, village halls and community centres, even the streets themselves. 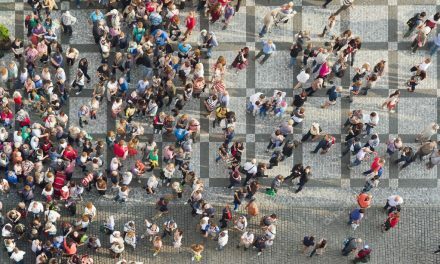 services that can facilitate access to places to meet, including urban design, landscape architecture and public art, transport, public health organisations, subsidised housing sites, and bus routes. 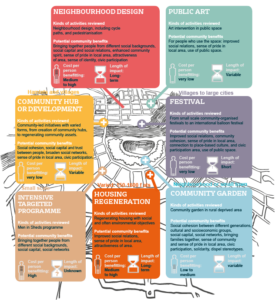 Community hubs can promote social cohesion, by bringing together different social or generational groups; increase social capital and build trust; increase wider social networks and interaction between community members; and increase individual’s knowledge or skills. Changes to neighbourhood design can positively affect sense of belonging and pride in a community. Green and blue space interventions that provide the opportunity to participate in activities or meetings can improve social interactions; increase social networks social interactions and bonding and bridging social capital; increase physical activity and healthy eating; improve community members’ skills and knowledge. In the visual summary below, each box contains approximate costs, potential community benefits, length of impact, and scale of impact (written above box). This information was gathered from a subset of the studies reviewed in the evidence review and is intended to give a general outline rather than an exhaustive review of the practicalities. It comes with a health warning: there was very little evidence beyond short-term impacts in the studies used. They are also based on assumptions about the length of time that infrastructure was in place, and from evidence elsewhere on the type of activity where effects may be longer term and where there may be adaptation. If your project, programme or activity has had an impact on loneliness in people of any age, please submit your evaluation reports to us. 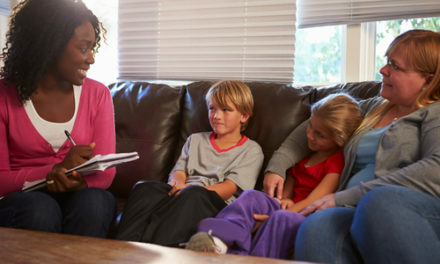 It could be used in a review to better understand what works to alleviate loneliness. I can imagine what a green space intervention may involve. What is a blue space intervention please? A blue space intervention is any project, programme or activity that involves water in an outdoor setting, e.g. lido, river, lake, sea, pond.